Thank you for reading and being informed. Holiday and city government events fill December. New city manager possible? New land use cases that might affect you? An ENERGIZED Downtown with music and entertainment action on sidewalks and street corners will occur in Old Town, Arts District and 5th Avenue. Dates and some events are listed in this newsletter for you to enjoy with friends and family. Downtown Scottsdale’s Western Spirit: Museum of the West scores again! The world’s premier collection of Western and Indian movie poster graphic arts has found a new home in the Western Spirit: Scottsdale’s Museum of the West. The Rennard Strickland Collection of Western Film History, valued at nearly six million dollars, consists of approximately 5,000 items—primarily posters and lobby cards dating from the early 1900s to contemporary times. (When movies were released, theaters historically received a set of eight 11”x14” photos − known as lobby cards − showing different scenes from the film for display in theater lobbies.) To read more, CLICK HERE. Holiday shopping? Go to YOUR Downtown western museum store for authentic southwestern gifts. Select ornaments, cowboy boot stockings, artisan-made items, holiday cards, children and adult books, puzzles, board games, home décor and more. The store is open Tuesday-Sunday during normal museum hours—no admission is required. All purchases are tax-free and support this nonprofit organization. Museum members enjoy at 15% discount. Annual membership for 2 seniors (couple or plus a friend) is just $60 and individual adult levels begin at $45. Details at http://scottsdalemuseumwest.org/support/membership/ Location is south of Main Street on Marshall Way. Our free trolley takes you to the front door. HOLIDAY SEASON IS DEFINITELY IN SCOTTSDALE ! Mark your calendar or load your cellular phone so you do not miss The Scottsdazzle events and special ArtWalks. Go to www.Scottsdazzle.com for all event details. · Don’t forget to see Scottsdale’s LED holiday tree near Scottsdale Road/Camelback Road on the southern end of the Solari Bridge on the AZ Canal. · In the Civic Center you will find a life-size Menorah lit nightly. Enter from the intersection of Brown Ave & Main Street and walk eastward beyond the Historic “Little Red Schoolhouse” into Civic Center’s expansive grounds and fountains area. 5pm City Manager candidate final interviews are in the Kiva. Attend or watch on Channel 11. Will the city council make a selection and announce it this evening? Our city has lacked a permanent city manager since June 2015. "I Spy Santa" Artwalk /Downtown Arts District. Families can search for Santa Claus throughout the Downtown and enjoy refreshments and live music with special artists such as Grammy-nominated flutist Sherry Finzer. 6 pm Scavenger Hunt on Marshall Way. Take pictures with the costumed Elves. Find Santa’s House. Have dinner downtown in one of the many restaurants Italian? Chinese? Mexican? Thai? 7 pm to 9 pm Free horse and carriage rides Dec 8, 15, and 22. Browse the Arts District galleries for specials 7 pm to 9 pm. · Browse the new location of the Pejman Gallery 7130 Main Street and meet artist, Bob Pejman. 5 pm to 8 pm…Local artists’ reception in The Angel Store in Kiva Center Courtyard Shops on 5th Avenue (west of Scottsdale Road) ….As part of Downtown Scottsdazzle official events, The Angel Store is inviting you to " Angels in Art. Light refreshments will be served while the live jazz quartet, The Phoenician Four, plays right outside in the Kiva Courtyard. Some of the featured artists you will meet are: K Nadine Booth, Kathleen Ekholm, Sandy Schenkat, Mary Clark, Alene Geed, Colleen Brown, Bill Follis, Dave Bigelow, Dina Petruzzi, Judy Wood, Steven Kaye, John Horejs, Anne Greiner, Carly Hack, and Meggie Thiesen ...to name a few. Holiday Fun at the Museum! 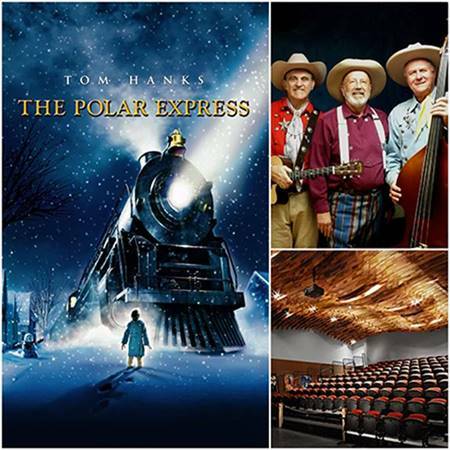 Holiday family fun begins at 10 a.m. with a screening of “The Polar Express," the cherished holiday film starring Tom Hanks. Based on the book by Chris Van Allsburg, the film tells the tale of one boy’s journey to the North Pole on a magical train. (Run time: 100 minutes; rated PG). Between 11 a.m. and 1 p.m., kids can participate in a silver bell scavenger hunt, make-and-take crafts and games. At 1 p.m., families can join OK Chorale members Yodeling Al, Jingel'n Jud and Tumbleweed Tony for an entertaining program of holiday songs and stories, western-style. Festive holiday displays at the museum will be on view during regular hours Tuesday, November 29 through Saturday, December 24 and include a one-of-a-kind gingerbread western town created just for the museum by noted Chef Jay Murphy of the KAK Shop. Guests can also delight in a Polar Express model train that will be on display! OLD TOWN COWBOY CHRISTMAS Family entertainment, free wagon rides from 1 to 4 pm Saturdays—Dec. 10 and 17 Board at the Main St and Brown Ave intersection by the Downtown Ambassador information cart. SUGAR PLUM AVENUE Family entertainment and decorations along 5th Ave. between Stetson and Marshall Way from 1 to 4 pm on Saturdays Dec 10 and 22. The major change is---To update the regulations pertaining to temporary and semi-permanent signs in the Zoning Ordinance, and remove special event sign regulations from the Zoning Ordinance. Tuesday, Dec. 6 from 5:30 - 7 p.m. One Civic Center 7447 E. Indian School Road Community Development Rooms 1, 2 & 3 then Wednesday, Dec 7th from 5:30 to 7pm in the via Linda Senior Center, Rm 4 You can e mail your comments to Andrew Chi, Planner achi@scottsdaleaz.gov or call him at 480-312-7828 to put your comments into the public record. (3) The city is seeking community input related to research and analysis findings to Downtown Scottsdale 2.0 (Tourism-related Downtown Economic Feasibility Study). This project includes several phases of work such as: an assessment of the overall urban design of downtown Scottsdale, and how that design can be improved as to walkability,pedestrian pathways and tranfsportation. Open house meetings will include a presentation by the contractor, CSL International, community and city staff conversation roundtables and an overview of comparable city case studies and concepts. Visit downtownscottsdale2.com for more information and sign-up to receive project updates and announcements. Open houses will be held at the Community Design Studio, 7506 E. Indian School Road. The Outpost conditional use permit for a gas station hearing will be held 6 pm Thursday, Dec 8th in the Copper Ridge School cafeteria 10101 Thompson Peak Parkway. Near 128th Street and Ranch Gate Road. The Storyrock applicant is also requesting approval of wash modifications associated with 1C case 5-PP-2016#3 as CASE#10-WM-2016 and with Phases 2A & B as CASE#12-WM-2016 and finally with Phase 3A as CASE#11-WM-2016.